Phillip was born in Peter Street, St Helens with his two brothers, James and Patrick. All three fought in WW1 and survived. Little is known about Phillip's record of service. However what is known is that prior to his enlistment he was courting Winifred Taylor of 28 Longton Lane, Rainhill and throughout his service abroad he sent her lots of postcards, which have been preserved (see Keep the Home Fires Burning page). It is from these cards that we know that on enlistment and after a period of training he was sent to France from Southampton on the vessel "Trafford Hall" which he describes as a "fine vessel!" During the next four years or so Phil continued to send postcards to Winnie and it is noticeable that as the long distance relationship progressed he became more affectionate! His early cards began with "Dear Winnie" and ended "Sincerely yours" whilst by 1918 this changed to "Dearest" and ended "Lots of Love Phil xxxxxx". When the war ended Phil did not return home immediately but stayed on assisting injured American servicemen who were being repatriated. It is thought he made at least two trips to the States without ever setting foot on American soil. They say absence makes the heart grow fonder and this was certainly the case for Phil and his beloved Winnie. 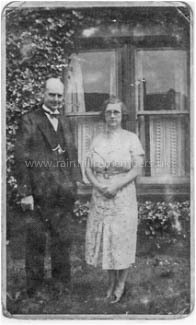 They married in 1921 at St. Bartholomew's Church, Rainhill and set up home in Longton Lane. In 1971 they celebrated their Golden Wedding! After leaving the army Phil went on to have a successful career in management, first at Ravenhead Glass Company and then at Pilkingtons. A sad footnote to the story is that Phil Lynch became the brother in law of the then late Bob Sutton when he married Winifred Taylor, the sister of Bob's wife, Mary May Taylor. While Phil survived the war, sadly Bob didn't. One can only imagine Mary's thoughts of "what might have been" when she attended Winnie and Phil's marriage. However the story has a happy ending as Mary later married Harold Sharples and they lived contentedly together. Acknowledgement: Ann and Jim Oakes for supplying this information about the postcards. 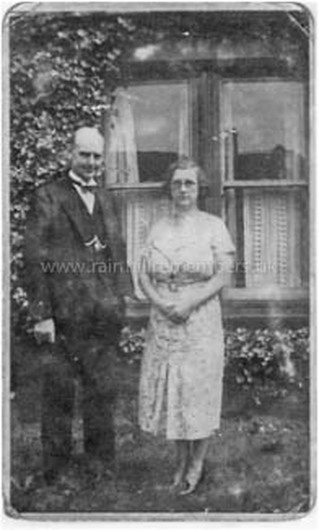 Phillip and Winifred Lynch outside their house in Longton Lane, Rainhill.